The villainous resistance of New York City was one of the last to hold out against the alien invasion. In response, Warlord Sh'tarka placed most of troublesome Manhattan under a deadly and impassable energy field. Now your villain has to fight for food, weapons, resources, and dominance. She's trapped inside the crumbling city with all the other villains, do-gooders, gangs, scavengers, and more than a handful of strange creatures. Or are they trapped in there with her? 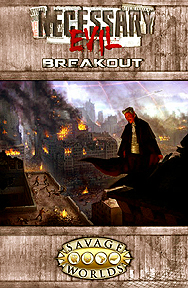 Necessary Evil: Breakout is a Street Level Supers prequel to the smash hit Necessary Evil. You need only the Savage Worlds core rules and the Super Powers Companion to play. The original Necessary Evil is NOT required.